Be prepared to have them lock your card multiple times without notifying you until your standing in line with a cart full of groceries at checkout. My wife and I have excellent credit and account is and was in good standing. Apparently BOA fraud thinks that grocery purchases are suspicious. It takes 6 months before they can learn your spending behavior. Until then you will be blocked without warning then have to spend over an hour on the phone only to re verify your identity to each of the 5 customer service representatives who you speak to. The will provide you with mis information more than once, and play phone games laughing at the situation offering no resolution. To me a credit card that you can’t use for daily purchases is useless. Unless you want to call BOA and sit on hold for hours to ask permission to buy something. Very easy to use and love the app! I'm able to always easily pay for my account by transferring funds into it through the Bank of America app. I can easily see in real-time all the purchases I make and choose what I want to get the most cash back on. Also, whenever I've needed some assistance I just use the call a specialist button on the app and it very quickly gets me talking to representative and it's super easy. Card is great but Bank of America customer service leaves some to be admired. I received a very nice welcom bonus and the cash back program is good. I pay my bills in full every month so I can’t comment on interest and fees. Good card to have if you are looking for rewards. BoA mobile app has rotating list of merchants that will give you extra rewards. For example Starbucks is frequently there with 10% casback. The card is a great deal for reward seekers paying bills in full every month. I started out as a secured BOA cc in 2013. Within 8 months I was graduated to a non secure credit card. Their fraudulent dept is stellar. The 3,2,1 % cash back deals have added up tremendously for me and the Bank Amerideals have been generous too. 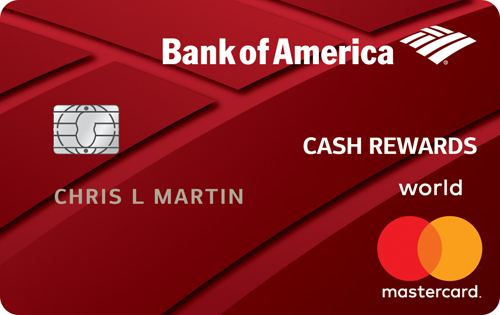 I’ve never had any issues with my card or services or BOA. I requested my first cash back check. I never received the check and called about it. They apparently re-issued the check, which is a situation in and of itself. Never received that. I called again and they said the second check was fraudulently cashed. They said they would send a letter to take to the bank where it was fraudulently cashed. The letter would contain explanation and check images from BOA. I never received that letter. What’s more than that is that they immediately told me that the check was fraudulently signed. I’m curious as to how they knew that off the cuff. No one told me that they had looked up my signature or anything to compare. This all all seemed very strange to me. I’m not sure what to think, but I’ve moved all my purchases to my other brand cash back card. Now they offer flexible reward categories. That's great. I went into my account to try to redeem rewards, fully expecting as usual that it cannot be done until you reach $25. Nope, not this time. I redeemed $12. Minimum redemption went from $25 to 1 cent. Excellent change.